7:00 am wake up call to coffee with the breakfast following shortly after. We are headed out by 8:30am to climb up the mountain side to the school that we have planned on visiting. Each one of us has brought a small gift for the children and had hoped to spend sometime directly with them. However, today is Saturday so the school is closed. No difference -- off we go up the steep pathway that leads to the spot where the kids would normally had been. First however, we need to cross the river -- the only way is a suspension bridge about as wide as a normal sidewalk. This serves as the main route back and forth. The path today is a mixture of steep flagstone steps switch backing up the side of the gorge, grassy pathways and rocks strategically sitting that allows a leap or two to get from one spot to the other. The path itself was no bigger than one person's width even though it was considered a two way fare. That meant at times one had to either step carefully off to the side as a herd of cows went by or stare the lead cow in the eye and hope that she moved. I chose to step aside! About an hour up the trail we encountered two women carrying large baskets full of greenery. They offered to allow each of us to try to carry the load a few feet. While easy to do for a few minutes, it would be hard over the long haul and they do it a thousand times each day. It is totally amazing the strength and stamina that these women have. The school sits high on a ridge overlooking the valley far below. Small in comparison to what each of us is use to seeing, it serves the elementary population of the area. This is a government school, not private as we saw in the valley. After leaving there we headed farther up the mountain to the village of Bee Hive where the Village Mothers were waiting for us. It seems that the women of Nepal control the leadership and monitoring of each village with a "counsel" of women known as the Village Mothers. They met us on the outskirts of the village with beautiful leis and guided us up the pathway to their homes. 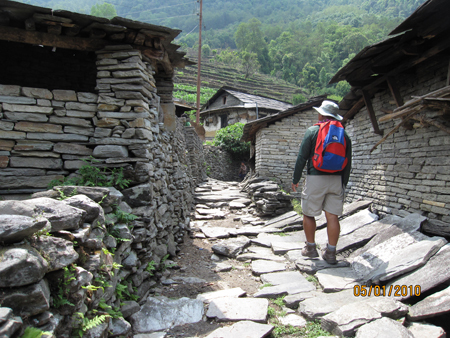 The village consisted of many small homes with narrow stone walkways connecting them. The sad thing is that the young men of the area have basically left in pursuit of a better life so much of the village is just old men, women and children. But that didn't stop us from having a great time. The women showed us with pride their homes, then after a beautiful lunch demonstrated the local traditional dance. Several were encouraged to join in on the fun and did giving the whole afternoon a great time of sharing. Two totally different cultures and worlds coming together for an afternoon of enjoyment! Following this "siesta" the trek continued up and up until we could barely see the valley below. The way was steep -- each step having to be perfectly placed -- but well worth the effort. The day was basically clear with a slight haze over the mountain peaks so visibility was phenomenal. For every up there has to be a down and the descend back to our lodge was as steep and challenging as the ascend, but it too was well worth the hike, Through bamboo patches, terraced fields, pass cows and water buffalo and an occasional village the time went fast. The next thing we knew we were crossing that suspension bridge once again and returning to our home away from home. The lemonade was waiting and all were tired. Tomorrow it is time to leave and return to a more urban area - Pokhara for a few days. Up We Go -- One Step At A Time! Preem: "This Way! Yes, Up!"